Over the past five years, in the face of growing internet security concerns, Bridge Ratings has pursued an interest in the state of the value of on-line registration of personal information by consumers on the internet. This is particularly of interest to an area of importance to Bridge Ratings and other research organizations: accuracy in the data provided by users. The problem has only been further exacerbated by security leaks at Facebook and numbers of credit, credit card companies, entertainment industry firms and political entities. 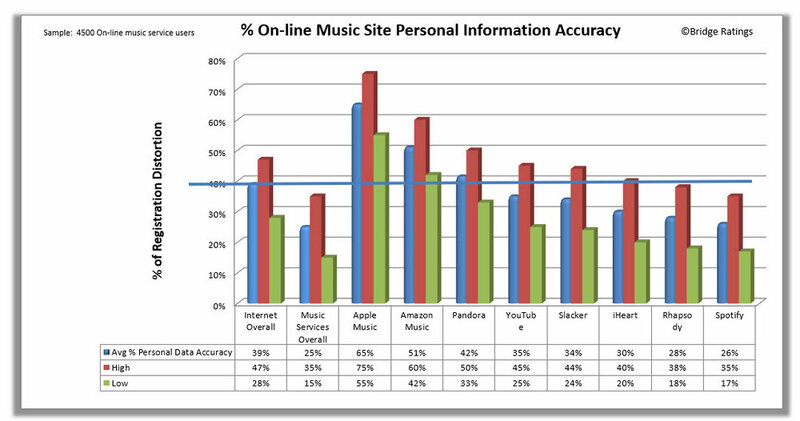 In a study updated this month for a group of clients seeking a better understanding of applied registration data in marketing and advertising as well as our own concerns for veracity in our on-line studies, Bridge Ratings has learned that for on-line music streaming platforms on the internet, generally, accuracy of private information stands at 39% - down from 48% two years ago. There is a range of accuracy readings for the on-demand streaming sites we studied with Apple Music and Amazon Music ranking best based on responses from the sample in our study. More than three-quarters (83%) of consumers in our panels who use the internet at least once a day for browsing, shopping, viewing or listening to content or other sites that require registration have little confidence that any personal information they submit will not be shared with other partner entities. For the online music streaming sites, users in the study admit distortion of some or all of the personal information they submit to registration forms. Some platforms perform better than others. Areas of distortion include name, age, gender, address, zip code, household income and other information commonly associated with lifestyle. In fact, the only situations where personal information has a higher degree of veracity are those involving financial sites which require social security numbers and accurate age, address, name and personal financial information. Yet, even these types of sites are beginning to show signs of distrust with 78% of respondents (down from 84% last year). It may not surprise you that personal information distortion is rampant all over the 'net. This new report includes distortion data for various types of internet web sites. One that we can share with you here is registration distortion for on-line music streaming sites. Most of our panelists agree that on sites that require credit card information to register, distortion frequently leads to approval percentages to drop. The range of distortion is consistent when looking at individual streaming services. The chart below compares overall internet registration distortion with pure play streaming services reflected by our sample. The problem of internet registration distortion is directly related to consumers' discomfort with personal information distribution and overall internet security of this information. As highlighted in Bridge Ratings' "2014 Year In Review", and updated in 2018, privacy security concerns are only increasing among the population and will continue to instill lack of confidence in any metrics directly connected to registration information. The implications of personal information distortion are significant considering so much marketing and advertising is based on much of the information provided voluntarily by consumers. 2019 will find companies which conduct business on the internet paying more attention to on-line registration and, if possible, improving the vetting of user information. This problem is especially troublesome to polling and research companies whose sole purpose is to reflect accuracy in their data. For media companies, this is particularly critical. And for radio or music-based companies, analyzing research data reliant on self-reported personal data online (age, location, gender) is likely to create reliability concerns among their clients. The updated study quoted in this article had a sample of 4500 persons 18+ across a national geography randomly selected by telephone or in-person interview who use the internet at least once a day for at least thirty minutes for browsing, shopping or viewing/listening to content. Dave Van Dyke at LinkedIn or sign up for the Navigate the Future Newsletter.